I have been on the tour since April 2013 and my first event was in Worthing for the British Masters. At the end of that season I was 43rd in the British rankings. By the close of 2014 I had climbed to 18th, then to 7th in 2015 and I currently sit 4th. It is quite odd to say that I’m ranked in the top 5 in the country at something, especially being in my forties. I realise that the company I keep at the top of the rankings is extremely good, so to be mentioned in the same breath as them is quite something. I have a few personal highlights from my time playing competitive minigolf. Finding out I had been picked for the 2015 World Adventure Golf Masters (WAGM) team in Hastings and then finishing 9th was epic. I am the current British Doubles champion which came with a beautiful glass trophy… I partnered Nuno Cunha who is a superb putter and we work well as a team. I think being able to call yourself a national champion of any event is very humbling, something I thought would never happen. This year I joined our Nations Cup team in Vizela, Portugal and was again selected for the national team for the WAGM in Kosovo where my experience was simply amazing. The people there were incredibly welcoming and the food some of the best I’ve tasted. The course was an absolute beast – I had seen a picture of it and thought ‘that can’t be real’ – then I turned up and it was even more hilly than I had expected. My aim was to try and get in the top 18 and qualify for the last round. I managed to scrape in with my last shot of the 5th round, a swinging 40ft putt over a large bump. In the UK I have a few favourite courses, I tend to like ones that are unique-looking and have character. Strokes in Margate is the ultimate test as every hole gives you an ace chance but can crucify you equally. Splash Point in Worthing is a course I used to play every week when I lived in Sussex. It’s a real challenge and sharpens your game up. My new local course is Peterborough Minigolf, a new UrbanCrazy build. It’s a great thinking man’s course and the owners have been very generous to me. Hastings is a Mecca for minigolf and adventure golf with a brilliant complex of 3 courses and food outlets. In my opinion a good skill-based course offers a variety of viable shots on each hole. If you can play a shot one way and your opponent plays it another with both working, then that’s great. If I have worked hard to put in a good score and if I feel the course has challenged me to use my mind, then that course designer’s job is done. I’m also interested in statistics from competition play and I look at UK no.1 Michael Smith’s record of 44 wins from 79 starts and think ‘that’s never going to be beaten’. The scores that Michael and Adam Kelly post around the Pirate Course in Hastings are mind blowing, averaging around 28. I set my best run of aces there with 6 in a row. I would say to anyone interested in playing competitive minigolf, give it a go just once to see how you fare. For me it has been an incredible adventure. I had never really played crazy golf until about 4 years ago. Since then I have seen places I never imagined going to and I’ve won 3 caps for Great Britain. 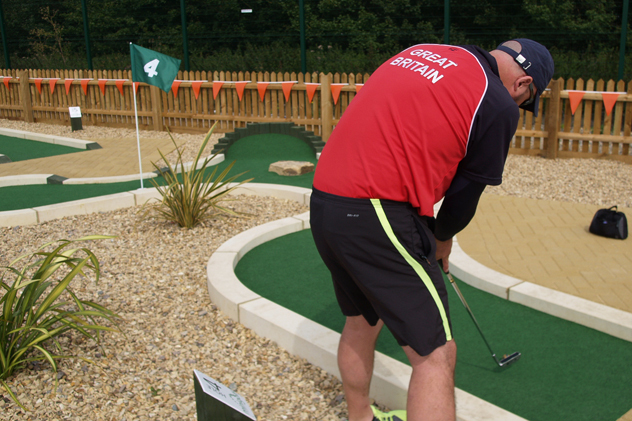 For information about the tour and to see if there is an event near you, visit the British Minigolf Association (BMGA) website. Who knows where it will lead!